In a few years they will be here. The hordes. While the fact that Angkor Wat and the tiny adjacent town of Siem Reap has more than ten, Five Star hotels and three golf courses is not at all a bad thing, the pre Tomb Raider days of “discovering” the relics of relatively unknown mystic civilizations are long gone from that part of SE Asia. Myanmar, formerly Burma, is a country rich in culture and steeped in a tumultuous history that the whole western world seems to have not much more than a once removed connection to. Even though the country seems to have been at war, if not with an invader, then themselves, for its entire existence, the reading of its metamorphosis over the eons has an adventurous romantic ring to it, invoking images of elephant silhouettes ghosting amongst mist shrouded temple spires of ancient civilizations splayed across verdant rain kissed valleys surrounded by steep, jungled mountains serving as rocky sentries guarding a millennia of culture, beauty and mystery. Its location and climate made has left it a tantalizing prize on a strategic crossroad for both traders and conquerors. For the same reasons Burma has been at the crux of several pivotal world events, today the country stands poised for invasion of a new marauder, the discerning traveler looking for an authentic experience. Of course sooner or later Myanmar will go the way of other emerging hot spots but for now, those looking for what author Rudyard Kipling noted, “This Burma is unlike any land you know about” can find exactly that. Once a British colony, the Brits, over the years built 20 golf courses before Burmese re-established their independence in 1947. While the country was in for more strife, the legacy of golf was indelibly imprinted on the landscape. The military and others subsequently built more than 100 more courses around the country! Golf is everywhere in Myanmar. However there is a catch, with so many years of more important business to attend to, many venues have fallen into disrepair and most have not been upgraded since they were built decades and some cases, over a century ago. Alas, while a golf historian may enjoy seeking out and analyzing the many tracks, a modern golfing traveler would not. But that is rapidly changing! Myanmar now has its own Open Championship that is a sanctioned Asian Tour event. The venue in 2017 was in Yangon at the recently renovated, Gary Player, Pun Hlaing Golf Club was a rousing success. 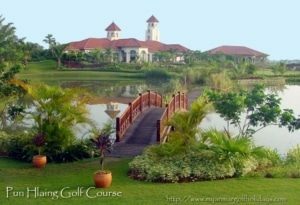 Dagon Golf Club also in Yangon, is an excellent new venue about to come online which will further enhance golf options that are up to international standards. Additionally, some of the courses around Myanmar while not in the best of condition by any stretch, are just too interesting to pass up. 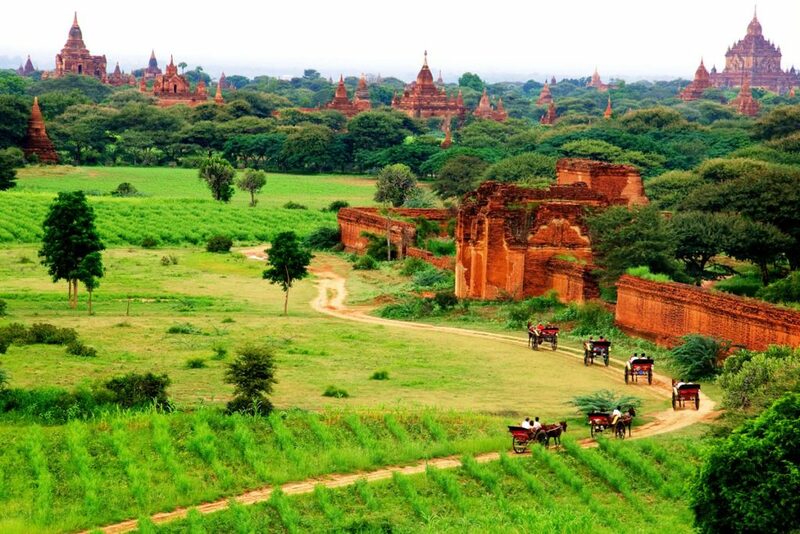 The Bagan Golf Club is almost magically routed amongst fabulous 11th century Temples, Pagodas, and Stupas. The oldest course in Myanmar, Thayet Century Golf Club was established in 1887 and according to their sign, is still affiliated with the St Andrews Golf Club and is a an interesting example of turn or the century British Design. 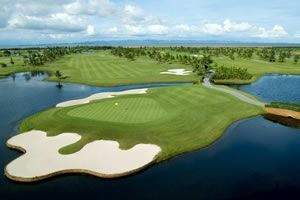 Myotha National, near Mandalay, is also a spectacular desert style course that will soon open and is sure to be rated a slam dunk world class venue. What may be the most exciting news about golf in Myanmar is that arguably Myanmar’s most successful golfer, PGA tour winner, Asian Tour Order of Merit winner, and recent Chairman of the Asian Tour, Kyi Hla Han, then known on the professional circuit as the “Burmese Bandit” has returned to his birth country with the mandate to raise golf to a level of international pride and make Myanmar and enticing destination for golf travel that accentuates the seemingly enchanted destinations dotted around the country. He is the signature co-designer with international designer Schmidt/Curley at Myotha National and his own design firm, Kyi Hla Han Golf Design is already well underway planning for several first class upgrades and a couple new courses at major tourism locations. 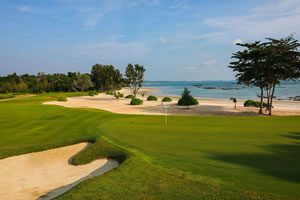 There is even talk of an international, multi-country golf trail and a domestic golf trail, accessible by luxury boat, which take golfers through wild regions with opportunities to sample the most spiritual and authentic aspects of Burmese culture and golf along the way. Han pointes to cooler highland areas in ethnic Shan State and to the western Beaches near Ngapoli as areas ripe for the kinds of experiential, adventure vacations many of todays’ golf tourists are looking for. So why golf in Burma now? Exotic, Authentic, Isolated, Exciting. Like no other. Ms. Marlar Aye who is the Country Director of Asia Expeditions in Yangon says, “Our Tourism Ministry is working very hard and closely with private sectors to develop more international standard courses, new renovation on our domestic airports such as Heho, Inle Region, Kawthaung, the southern capital of Myanmar as well as in Mawlamyaing, the last international Port before Myanmar’s independence from British. “Bagan is our classic destination with thousands of pagodas, Mandalay, the last kingdom of Burma is a must see stop, Lake Inle populated by groups of ethnic Tribes and is a natural lake over 900 Meters above sea level, and of course the beautiful beaches are second to none. We are constantly developing more products throughout the country. It has been a short three years of regular traveling to Myanmar and I am astonished at the pace of growth. When I first arrived a brief email took about 40 minutes to download, today my wifi speed at the Novatel in Yangon was significantly faster than my connection in downtown Bangkok and with the purchase of a cheap SIM Card I had 3G or 4G even in most remote areas. Myanmar will always have its magical charms for me as does Cambodia, Vietnam and so many others. As with those places, it feels like I took a nap one day to wake and discover they were suddenly, culturally transported, decades forward. This time I am making a concentrated effort to mindfully dedicate to memory each personally touching moment and experience while the endearing innocence still exists ahead of the wave of modernity to come. As Mark Siegel from Golfasian says, “…Now is the time and Myanmar is the place”.